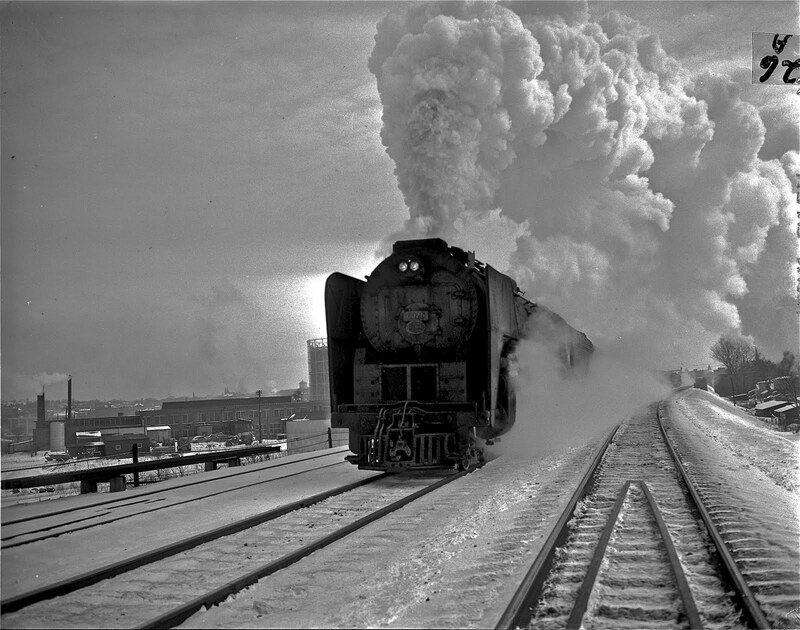 Westbound "Empire State Express" pulled by an S-1 class Niagara 4-8-4 leaves Syracuse amidst of cloud of white smoke and swirling in the early 1950s. 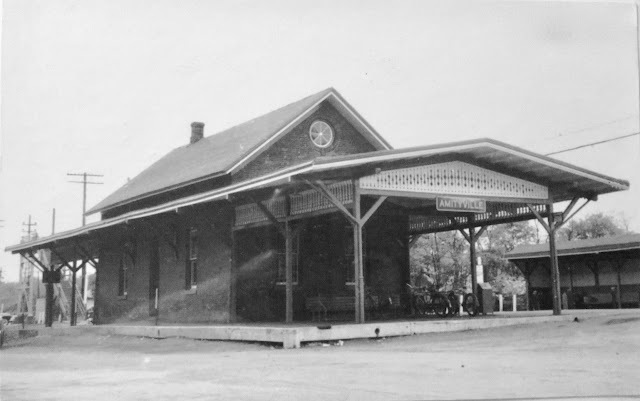 Steam was replaced by diesels east of Buffalo in 1953. Niagaras were all retired by 1956. A decade later this would be I-690. 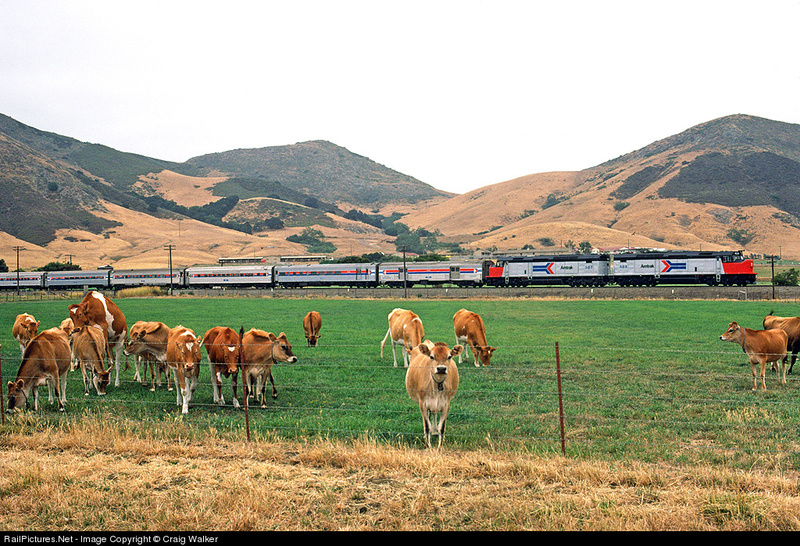 Amtrak train #11, the Coast Starlight, passes through the pastures of Cal Poly University (which has an extensive agricultural program) in San Luis Obispo, California, on July 2, 1974. SDP40Fs 583 and 587 are in charge of this train as it heads from Seattle to Los Angeles. Photo by Craig Walker. The D.L. & W. Works. Building New Coaches - Improving Trackage - Lots of Things Going On. Mr. J.D. Remington, Paymaster of the Oswego Division of the D.L. & W. R.R., very cleverly showed us through the D.L. & W. works in Oswego yesterday afternoon, where there is no sign of depression and inactivity which most everybody is complaining of. One hundred mechanics are afforded constant employment on full time - a fact which indicates the value of these works to the town. Since last December these shops have been building five coaches for the Morris & Essex Division, along with keeping up the repairs to the rolling stock of this division, all of which work is done under the supervision of Mr. George Nelson, the competent and energetic foreman of the works. Several days ago the Pullman shops at Buffalo were damaged by fire to the extent of a half million dollars loss. Fifteen hundred workmen are out of employment at least temporarily as a consequence. It is rather a discouraging position in which to be placed when most fathers, sons and brothers are working with more than ordinary energy that they may earn sufficient money to make glad the heart of Christmas morn of those whom they love. More disappointing yet is the humor that the big plant will not be erected in Buffalo but that the work will be transferred to Pullman, Ill.